Hello, loves! And happy mid-week to you! I'm not sure what it is, but here lately I've found myself completely in love with shades of blue and green. Maybe it's the fact that I've just returned from a week away at the beach? Or maybe it's simply the calming nature that I'm drawn to? Whatever the case may be, one thing is for sure... I definitely can't get enough of these calming hues. Because what's not to love? Also I really like how this palette easily incorporates the softness of sea foam and mint and yet, still makes room for a good dose of punchy color. Like that vibrant aqua! It's this balance between softness and brightness that really captures my attention. So what do you think? Might you consider this palette for your upcoming wedding, party or project? I'd love to hear your thoughts! 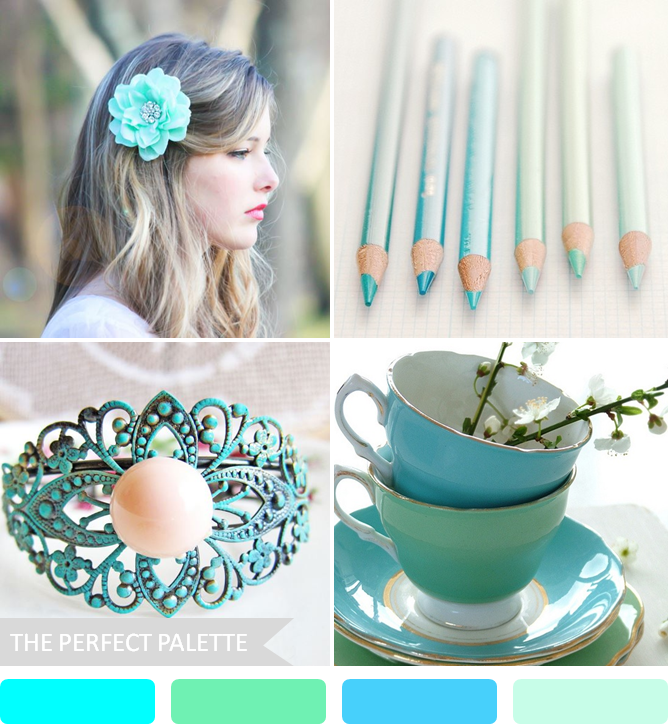 13 Comments " Party Palette | Aqua, Sea Foam, Blue + Mint "
Now I'm dreaming of a beach day! Can see you enjoyed your beach break! Lovely combination here! Absolutely love these colours, and I think they'd work in lots of different styled ceremonies (ie not just for a beachy weddings, although they'd look great there too!). I think that tone of blue looks good on people with a range of skin tones too (such a tricky thing to get right) so could be a good bridesmaid dress colour or accent colour. Lately I've been loving a mixture of mint and seafoam... why is it so amazing??? Love! I love this palette :) Bookmarking it for later! Goodness ;) This is beautiful! I'm in love with this color palette. Oh wow! This is a definite keeper! Love!